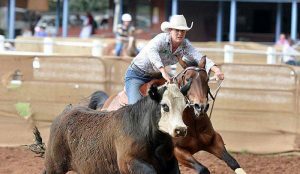 Kimberley has been one of the leading campdraft competitors within the ACA for a decade. How has she achieved this? When you talk to Kimberley about drafting its clear that she has put a lot of thought into how she sets up her yards and rides a course. Despite all her achievements she rates winning her first Juvenile title has her most memorable due to the commitment required from her family to come from behind and claim the title. Some of Kimberley’s theories are unique and may help you to challenge your thinking about how you approach your runs.